And here we go with the twelve-inchers, in all their glory. If you know any further details, or do have anything not listed here, please e-mail me! This is a promo item given away to radio stations. 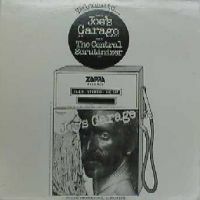 [EDITOR'S NOTE]: This is a funny one, because the record runs on 33 1/3 rpm and has only two very short tracks included. Most of the disc space is occupied by the run-out grooves, which would make a title like "Shut Up 'N' Play Yer Run-Out Groove" b/w "Shut Up 'N' Play Yer Run-Out Groove Some More" more appropiate. Being probably the disco and album mixes. Both versions are stereo mixes. From Mikael Agardsson: The 12" version of "Dancin' Fool" was a unique disco mix (06:21 long, listed as 06:15), which was re-released on the vinyl and Japanese CD versions of the Strictly Commercial compilation. It has a longer intro, with some sound effects. The cover has the back cover picture from Sheik Yerbouti. There's no mention on the Holland promo copy Dancin' Fool being a disco mix, but it sure is the longer version. [EDITOR'S NOTE]: I don't know if the UK copies are completely the same as the Holland (Netherland) ones, or if there's something mentioned on the sleeve being UK-specific. I think those copies sold in the UK may be just imports from the land of cheese and tulips. A picture of the label can be seen here. There's also a single release available, and a Maxi-CD with the title song and the same cover art, but not including the B-side. 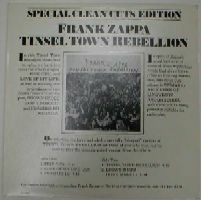 The printed text on the front reads like this: "In this Tinsel Town Rebellion clean cuts sampler, we have two potential smash singles: FINE GIRL and LOVE OF MY LIFE, as well as exciting live re-creations of two Zappa classics from the past, BROWN SHOES DON'T MAKE IT and PEACHES EN REGALIA. 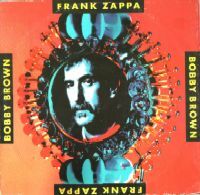 In spite of Zappa's usual inclusion of some of those mysterious words that drive hypocrites to foaming distraction, this clean cuts album is REMARKABLY FREE OF LINGUISTIC NAUGHTINESS, with these tracks being perfectly suitable for radio play. On side two, we have included a specially "bleeped" version of TINSEL TOWN REBELLION for those of you who may not be able to play the unexpurgated version from the album. A bigger picture of the sleeve can be found here. [EDITOR'S NOTE]: Curios that one and the same record company releases the same item under so many ordering numbers at the same time. Here is help urgent. Mail me! In the meantime you can divert yourself and looking at the disc in all its glory here. 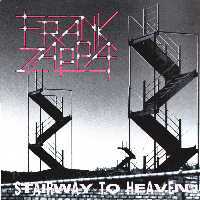 See also the next item, the same picture on the disc, but different tracklist, from Europe. The BPRP 114 version has a different sticker attached on the front. Instead of white, this is lilac, and looks a bit different. [EDITOR'S NOTE]: I found the single here in Germany, where it was also normaly sold. The golden sticker you see on the sleeve lists the german 1982 tour dates, beginning from 05/12/82. But it sure is an english pressing, with the copyrighted 1981 note. 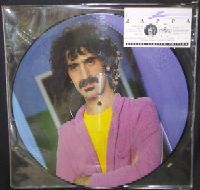 Please also note the item above, which is the same picture disc, but with different tracklist, from the US. The Barking Pumpkin AS 1485 one has the lyrics to Valley Girl printed on both sides of the inner sleeve. 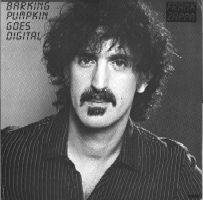 Dateline Los Angeles California, 1982... Zappa delivers yet another album for Barking Pumpkin, creating no excitement whatsoever in a Reaganomically, reacnionally seven-ninety-eight sort of freeze-dried aesthetic decision made by accountants from New Jersey kind of industry. Zappa opened no appearance at the Abrams Convention nor did 3,000 screaming teenagers give him a standing ovation. 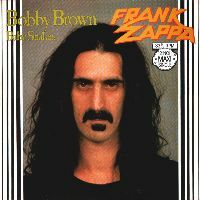 In the tradition of Aerosmith and Van Halen, which this album is not, excitement does not exist, nor will it mysteriously appear, sice who cares if there's another Zappa album anyway. Because of the incredible lack of interest in this sort of thing , there will maybe be some time-buys... who knows... nobody wants to spend any money on that kind of crap anyway. 2-3 weeks after release, the absence of any full-page advertising in Billboard will highlight the futility of making any advertising claims whatsoever about any album that is not in the current tradition of Formula - poot - kiss - the - hiney - hole - of - some - guy - who - gets - your - record - on - the - radio - if - it - sounds - like - Styx - to - a - half - deaf - donkey. A teaser campaign will not be run nor will it be walked for any tune in this album since who can afford it anymore? There's only 6 songs on the album, and you probably won't enjoy any of them, so if anybody says listen to: No Not Now, Valley Girl, I Come From Nowhere, Drowning Witch, Envelopes and Teenage Prostitude, just tell them that you're not into that sort of thing and make them go away. In line with Van Halen, Aerosmith and Loverboy, you can look for tonnage among the 14 - 21-year-old audience, with a slight lean toward the males. Since this album is not in line with any of the above - mentioned artists, there seems to be no reason to release it in today's America, but maybe somebody made a mistake. 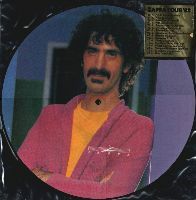 Because of getting any of Zappa's stuff on the radio in America, now that programmers have choosen to go with concepts prevalent in the industry 20 years ago, the release of a single would seem to be a waste of money... and that's all we really care about (it's the thing that sort of sets us apart from the Communists). 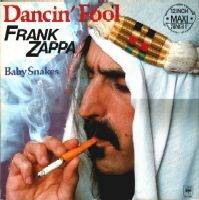 Zappa has some kind of following somewhere and maybe they will buy it... who knows. Because they do not follow the same demographics as Loverboy and Van Halen, expect no support on the West Coast. The band is going on the road in Europe May thru August... this won't help much in the States. A pre-release mailing didn't work the last time, so there probably won't be one this time. both sides have additional "Dinkum"
From an unknown soul over at ebay: "October 1982... Frank writes: Dear Radio Station Person: This is a special 12-inch version of three selections from my new three record box set "SHUT UP 'N' PLAY YER GUITAR". Since Barking Pumpkin is just another one of those miniscule sleazoid marginally desperate independent small record companies facing extinction... can't afford to press up any more of these things. 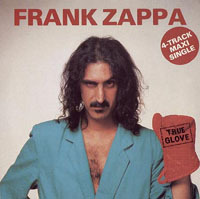 Yours Truly, FZ" is a "signed" letter from Frank which, in it's entirety, is printed on the front of this limited edition, very rare collector's item. 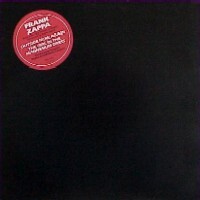 The WHITE COVER front is near-mint, BACK COVER is black with white lettering. As always, a picture of the label can be found here. Pictures of this item can be seen here. BARKING PUMPKIN is proud to announce that ALL FUTURE PRODUCTS WILL BE DIGITAL, with special releases on CD FORMAT as that technology becomes more available at the consumer level. This special disc will serve as an introduction to the quality improvements made possible by the new digital equipment recently installed at the UTILITY MUFFIN RESEARCH KITCHEN (U.M.R.K.). 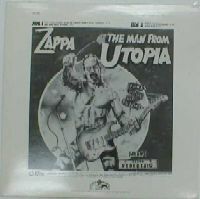 Side One includes two selections from "THE MAN FROM UTOPIA" LP (recently serviced to you in the analog format). These two songs have been re-tweezed with the digital machinery. Side Two gives a preview of the "LONDON SYMPHONY ORCHESTRA" LP which ships June 9th. We think you'll agree that the change to digital at BARKING PUMPKIN marks the beginning of an exciting new era in experimental audio entertainment. 3.Johnny "Guitar" Watson's voiceover from the Thing-Fish CD version of "He's So Gay" (not on the LP) has been added instead! I guess he likes it. The boy's into rubber EV'RY NIGHT? Yeah ... that's what they say. Aw, look, have you ever SMELLED rubber? I guess it's OK, l-look at his woman, yeah, I-I guess it's all right. Don't tell me that. Yes, he is. Wait a minute ... Uh-huh. ["Won Ton On" has nothing here] Wh...? (Eh!) What is the problem? Yeah; that's what it is. Uh ... least the boy ain't gonna reproduce hisself again. Uh, what I'm a borrow? Don't you tell me this! I said: don't you tell me this! Oh, gay ... (Eh!) What is the problem? ["Won Ton On" has already faded out here] You just did! The cover is a picture from the same photo shoot as the back cover of Them Or Us. The thing is "Printed in Germany by 4P Nicolaus GmbH, Köln". This is a promotional record for the Pierre Boulez album "The Perfect Stranger". Picture of cover and label here. 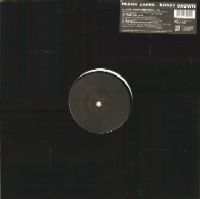 Side A has the ordering number 9207 on the label, whereas the B-side shows 9208. The sleeve shows no ordering number. re-mix of the original master. Spencer Chrislu? Do you hear any difference there?" did not yet have sampling capabilities on his Synclavier. The original european EMI album credits Bob Stone for remixing, with Spencer Crislu not being involved. 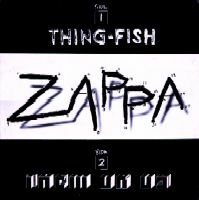 This record promotes both releases "Thing-Fish" and "Them Or Us". The funny things are those striked ordering numbers visible between the run-out grooves. It seems that the record was intended to be released with switched A- and B-sides. Pictures of the labels can be seen here. From "The Best Band You Never Heard in Your Life", but this "Bolero" track has seven extra seconds of applause that are edited out from the album version. :) Also available as a CD single. There's also a CD version available. 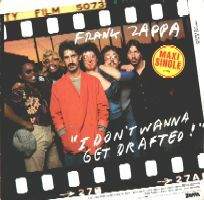 Composed/Arranged by Frank Zappa, Published by Munchkin Music ASCAP Manufactured & Marketed by Reel Reords under exclusive license from Today Croydon Ltd. 1979 Barking Pumpkin Records. plus the same data "Composed/arranged etc." as on the other side. Also mentioned: 33 1/3 Stereo (but it is 45 RPM!) BIEM/ncb." Pictures of the German release can be found here. This item looks somewhat like all the DJ vinyl for those mix and scratch masters. Simple sleeve with sticker attached, or just scribblings on the cover or label, with not much info. I don't know if stock copies of this hit the stores, however, Ryko / Rough Trade (now Zomba) sold a CD version of it the very same year. Seems strange that the German record company used those bootleggish labels instead of company ones. The big note: Like most of you I, too, have a regular life and have to go to work each day, so do not expect updates on a daily basis, nor a prompt reply to e-mails. Just give me a little bit of time. And then there´s always the question of violation of copyrights. If you think that my pages contain material which I´m not allowed to include because of its protected status, please drop me an e-mail, and I will remove the doubtful parts. On the other hand I regard all material within my pages as protected by copyright laws, too, so please ask before you steal. I´m sure we can work something out.